This book provides a theoretical background to occupational stress, and traces the early work of Hans Selye and the development of bio-physiological, psychological and then sociological models of stress. It also reports on a study of stress and ill-health in a large manufacturing organisation in Australia. It examines the effects of stress, low self-esteem and poor mastery on psychological outcomes and ill-health symptoms. An overview is presented of Western industrial economy and the importance of work stress in modern Western industrial society. The aims and organization of the book are also presented. The developments of the stress concept are traced from their early biophysiological and later psychological roots. Purely physiological models are shown to be far from explaining the causes of stress. Later psychological models address cognitive and emotional responses, but do not deal with social and structural causes of stress. Literature on occupational stress is reviewed which examines the role of negative work factors on ill-health. Much of this research has been psychological in orientation. 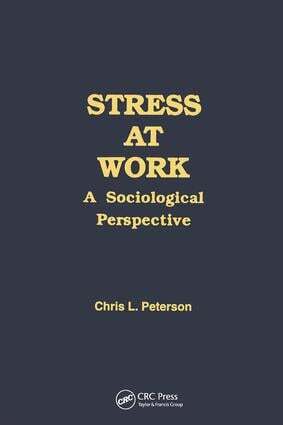 This chapter addresses the contributions of sociological approaches to understanding the causes of stress at work. Sociological approaches focus on social and structural factors and identify their role in work related stress. Later developments in labor process approaches are presented and show the role of technology in enhancing management control. Management control over the labor process is identified as an important factor in work related stress and ill-health. Arguments about the broader sociopolitical context of stress and ill-health are reviewed. The role of the state is presented in regulating work conditions and in supporting management's control over work, and hence in contributing to the occurrence of stress at work. The method used for studying the experience of stress and ill-health in a large manufacturing company in Australia is presented. A causal model of factors contributing to stress and physical and psychological ill-health is developed and forms the basis for the remaining chapters in the book. The factors contributing to negative work experience are outlined for the company in the study. Based on the causal model the contributions of a number of sociodemographic and work factors on alienating work are presented. This chapter uses the causal model and path analysis to test the major factors that contribute to stress at work. Different occupational groups, and women and men are compared. The effects of negative work experience and other factors on self-esteem and personal mastery are focused on. Much of this chapter looks at the effects of different occupational membership on these two states. The ill-health consequences of stress, low self-esteem and poor personal mastery are examined. Stress is shown to be a major factor in the incidence of a number of ilnesses. Blue collar workers are shown to have the poorest health. Factors accounting for psychological ill-health as measured by minor psychiatric impairment are presented. Again stress has an invested role to play. Blue collar workers are shown to have poorest psychological health. This chapter concludes by presenting the implications of blue collar workers' health disadvantage and that of women for the management and organization of work. It begins with the need to de-emphasize management control and adopt forms of organization that promote less stress and therefore greater health among workers.